Each year the Adelaide City Council celebrates Colonel Light’s birthday in April, with 2013 marking the 154th anniversary. 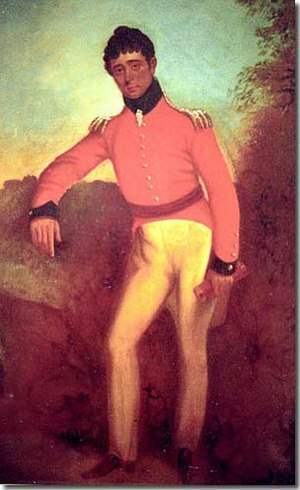 Colonel William Light was South Australia’s first Surveyor-General and founder of the City of Adelaide. He is celebrated locally and around the world for his unique design of Adelaide as a “city within a park”. The Colonel Light Ceremony arises from a Council resolution dating back to 1859, when Colonel Light’s friends presented the Loving Cup to Adelaide City Council, and asked that they “gather each year to toast Light’s health with South Australian wine“. Watch the below footage of this year’s ceremony, including an address from Deputy Lord Mayor Clr Dr Michael Llewellyn-Smith AM. Died 06/10/1839 of tuberculosis, aged 53, and buried in Light Square, Adelaide. Overlooked for the role of Governor of the new Colony of South Australia in favour of John Hindmarsh he was instead appointed Surveyor General, to select and survey a position for the Adelaide settlement. 176 settlers arrived on the HMS Buffalo after a five month journey from Portsmouth and on 28th December 1836 at Holdfast Bay celebrated the proclamation of the new South Australian colony. Colonel Light set about his task almost immediately. It took him just two months to complete his survey; from the 11th January 1837 until 10th March 1837; but it took far longer for him to counter arguments from Governor Hindmarsh and others that the settlement be nearer the Port of Adelaide. The dispute took its toll on him, and he resigned from his position in 1838, and died the following year. He exercised his authority however, and chose a plateau of land south of the Torrens River that ensured adequate drainage above the low-lying swamps nearer the coast. There was ample fresh-water from the nearby creek, and he observed that Mount Lofty was often shrouded in rain clouds. He correctly assumed that the Adelaide plains would receive an adequate rain-fall. The soil along the Torrens Valley was rich and fertile, timber and stone for building was available, and coal for fuel. There was suitable grazing land nearby, and it was a place of scenic beauty. Including with the city extension north of the Torrens River the total area of the City of Adelaide is 15.6 sq.km. with 7.6 sq.km. parkland. Within the square a grid of wide north-south, and east-west aligned streets are interspersed with narrow alleys. There has been ample room for city growth; civic buildings, shops and houses. A wide boulevard connects the City to Port Adelaide. Room was provided in the centre of the road for a water canal to transfer supplies from Port Adelaide. This has never been constructed, but the land has been utilized in other ways. The bulk of the Adelaide City area was residential from the outset. In 1840 Australia’s first municipal council, known as the Adelaide Corporation became the forerunner of the Adelaide City Council. Adelaide’s population was then 8480, with 1519 buildings. It continued to grow steadily, reaching a peak of 43,133 in 1915 at the outbreak of the first World War. 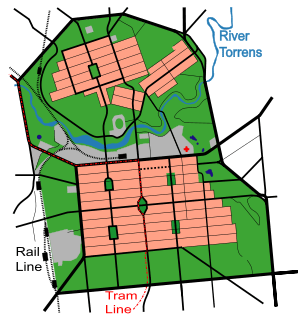 But increasingly urban sprawl for family homes has been north and south of the City square, and Adelaide’s population living within the City declined to 11,405 population in 1993 when Council took measures to attract more residents into high density City living. The permanent population has grown to 21,800, but during the day the population including workers and visitors, swells to over 200,000. A City of Antipathies not a City of Apathy. The 173 year old Adelaide City Council has been a diligent custodian of Light’s Vision for Adelaide, seeking to keep the rich heritage he provided, and in the process has often been seen as obstructionist, frustrating State government plans for developments considered in the best interests of all Metropolitan Adelaide Residents. The current Lord Mayor is the able Stephen Yarwood, a qualified town-planner with 20 years experience in State and Local Government in South Australia, who also has a MBA degree from the University of Adelaide. He has a vision for Adelaide, and is by nature a conciliatory person. The Council is fortunate to have someone of his ilk at the helm to steer a balanced course taking into account the often competing interests of permanent City of Adelaide Residents, the commercial interests of service providers, and the public. Daniel Wills in his excellent thought-provoking article in the Sunday Mail March 5, 2013 denigrated the role of the Adelaide Council labelling it “a suburban council in charge of policies that are immensely important to our capital city”. He pointed out that in 1840 it represented nearly all the State’s population; today it is much less but there are many more stakeholders, indeed all of Adelaide has a vested interest in the health and vitality of the City. If a larger population of residents in the City of Adelaide is a priority for both Adelaide Council and the State Government, then planning must make sure of their safety in the face of zones of increasing alcohol consumption. Sophisticated buzz and excitement will soon be extinguished in the years to come if high-rise residential blocks degrade into slums. Of much concern is the assertion that “parklands sit idle and are treated like a museum piece behind a glass pane” Today Adelaide’s parklands are still highly prized and viewed by many as sacrosanct. The State Government incurred the anger of conservationists early this year when it summarily bulldozed an avenue of long-living, but slow-growing White Cedar trees of much botanic interest. They were far from being the sickly trees alleged. If the City of Adelaide is to become a family friendly area to live, there should be more parks not less; with children’s play-grounds within the city square close to homes. The City has appeal for retirement living but the elderly have special needs to cater for too. Or do we wish to just create Australia’s best entertainment district? The City of Adelaide cannot be all things to all persons. Long live antipathy between the Council and the State government if it ensures there is an appropriate balance between conservation and development in plans for the next 173 years! This entry was posted in Adelaide development, Political debate, The Environment and tagged Adelaide City, John Hindmarsh, Light Square, Mount Lofty Range, Surveyor-General. Bookmark the permalink.